New York prepared me for Delhi in ways I didn't expect. Although the scale differed, I wasn't shocked at the thick layers of traffic racing wildly through the city, autorickshaws constantly honking and swerving to avoid collisions, the dirt and grime permanently cloaking the city. Like New York (or most large cities), people ask for money and people piss unabashedly out in the open. But obviously the scale makes these scenes much more intense and unfamiliar. There is so much dust. Much more than any developing countries I've visited such as Mexico, the Dominican Republic, or Peru. Dust permeates everything covering street, building, human being. Dust hangs in the air creating rivulets of sunlight that stream through the trees saturating the landscape with a drowsy aura of light. Dust rolls through the mouth, coating the teeth and nostrils tasting like diesel. The sheer number of humans are also, of course, mind numbing. Impossible to think that everyone has a separate story that you know nothing about except what you can glean for a couple seconds in a passing taxicab. And those stories themselves so insular and so beyond the scope of anything that glance could ever really know. My friend Jean had arrived safely before me and the next day we set out to explore the south of the city. We hired a car and first went to Humanyun's tomb. Humanyun was the second Mughal emporer who united parts of Afghanistan, Pakistan and northern India in the 1500s, as had his father Babur before him. In 1556, as Humayun was descending the stairs to his library, his arms full of books, he heard the call to prayer and attempted to kneel, thus slipping and breaking his neck effectively ending his reign. His wife, Hamida, built an elaborate tomb in his honor that is maintained on beautiful lush grounds with running fountains. 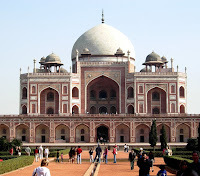 It is one of the earliest examples of Mughal architecture that emphasizes harmonious symmetry throughout the structure. Staring into the water rippling out from the fountains is intoxicating, creating elaborate vibrating strands of golden electricity. 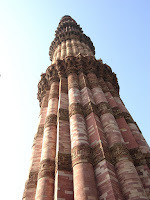 We next drove to Qutub Minar, an Islamic tower that is the tallest brick minaret in the world. It's built of fluted red sandstone and covered with carved verses from the Qur'an. While amongst the surrounding ruins, a class of Indian children ran up asking if we would take pictures with them. We put our arms around them all smiling broadly as they asked us questions and their instructor took photos. It was a lovely moment and a reminder of how rare white people can be in India, even among the tourist attractions. We grabbed lunch at a delicious Pakistani kabob house called Park Balluchi in the Kauz Haus Deer Park, a refuge for deer, peacocks, rabbits, and guinea pigs. We had tandoori style lamb kabobs and mewa paneer tukra which is soft cheese stuffed with nuts, currants, and mushrooms, then marinated in cream and grilled. Couple that with a couple of Kingfishers and the best garlic and butter nan I've ever had and we were extremely happy. After walking around the park, we drove to Dilli Haat, a crafts bazaar with beautiful wares from neighboring states. I felt like I was dealing with the poverty okay. I still regretted not giving the small three year old girl dressed as a clown doing backflips outside the car any money because I couldn't perform the conversion rate in time. But on the whole I didn't feel as shocked as I'd prepared myself for. But after getting home, the emotional toll hit us (possibly with some residual jet lag) and we both fell deeply asleep too tired to go out or even eat dinner.